Thirty years after proclaiming “It’s Raining Men!” Martha Wash is still going strong. In a career that has spanned nearly four decades, Martha’s voice can be heard singing some of the biggest hits in dance music, including the chart-topping “Gonna Make You Sweat (Everybody Dance Now)” and the inspirational “Carry On.” However, as Wash once put it, “Unless you are a die-hard fan, you wouldn’t know who I was.” Now, The Queen of Clubland is reclaiming her legacy. After earning eight #1 hits and an additional eight Top 10s on various Billboard Charts, she is releasing Something Good, her first collection of all new material in almost 20 years. In 1982 the duo announced, “Hi, we’re your weather girls and have we got news for you!” Within the blink of an eye, Two Tons O’ Fun became The Weather Girls and “It’s Raining Men” went on to receive a Grammy nomination, an achievement Wash considers the most memorable moment in her career. In 1984 The Weather Girls lent their voices to Rebbie Jackson’s hit, “Centipede.” By the late ‘80s they went their separate ways, and Wash forged ahead as a solo artist. Although she’s recorded several ballads, including her #1 R&B duet with Luther Vandross, “I Who Have Nothing,” Wash has been labeled a dance artist. Proving she is much more, Something Good finds the songstress taking chances and singing skillfully crafted pop/adult contemporary songs. The first single is the beautiful ballad “I’ve Got You.” Written by Rony Goffer and Zach Adam, winner of the Billboard Songwriting Contest Pop Award, it’s a song Wash says speaks to everyone. Initially she had reservations about performing material her audiences wouldn’t expect, but realized that as an artist, she could no longer play it safe. From the opening lines of the collection’s title song, also written by Adam, Wash reveals to her listeners that a fire has once again ignited inside her. She sings: “I’m feeling something. It’s been a long time, since I’ve felt something was burning inside. You’ve got me thinking I’ve been missing out.” The song drives with pulsating rhythms and Wash’s big, but never over-powering voice soars through to its conclusion. You can’t help but be convinced that she has been dreaming to deliver these kinds of songs for quite some time. It’s only fitting that she would remake the Aerosmith classic, “Dream On” for Something Good. Wash has done that time and time again. In 1991 Wash proved her strength and became a pioneer for artists when she sang the lead vocals on C&C Music Factory’s #1 hit, “Gonna Make You Sweat (Everybody Dance Now. )” However, in the accompanying music video, her vocals came out of the group’s lead singer’s mouth because her image had been deemed unmarketable due to her size. Furthermore, she also failed to receive proper credit and compensation on vocals she did for Black Box’s album, including their Top 10 songs, “Everybody Everybody” and “Strike It Up, and Seduction’s “You’re My One and Only (True Love. )” Where others may have backed down from this fight, Wash filed a lawsuit and won. Her efforts now make it mandatory for artists to receive accurate credits on albums and music videos. 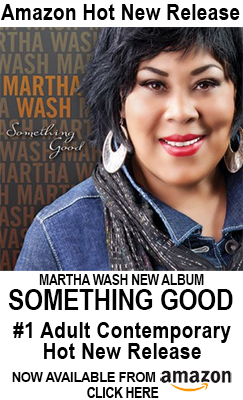 Wash hopes the eight songs from Something Good, which she calls empowering,will inspire others to find their strength inside and follow their destiny. “Whatever song they listen to, I hope they get something positive out it. I want them to think about themselves and about helping others,” she says. Something Good comes on the heels of the 30th anniversary of “It’s Raining Men.” It seems impossible to comprehend today, but Barbra Streisand, Donna Summer, Cher, and Diana Ross all passed on the iconic song written by Paul Jabara and The Late Show with David Letterman’s Paul Shaffer. If you don’t know who Martha Wash is by now, you’re missing out on something good. This entry was posted in News, Press Release by Attila Juhasz. Bookmark the permalink.